Miguel Ángel Cortés was born in Granada on 26 January 1972. He descends from a long line of flamenco guitar players. Therefore, it can hardly be called a wonder that Miguel Ángel is continuing this tradition. As a mere eight-year-old he got to know the world of flamenco through the famous Sacramonte Zambra. In 1986 already, he started working as an accompanist for great dancers such as Mariquilla, Manolete, Antonio Canales, Javier Barón and Juan Andrés Maya. With these stars, he completed several tours throughout Europe, the Middle East, the U.S. and Japan. Furthermore, he also made an early start in accompanying the greatest Cante Flamenco figures, as there are Jose de la Tomasa, José Merce, Chano Lobato, Luis Heredia “El Polaco”, Morenito de Illora and Estrella Morente. In 1990 he started working with singer Carmen Linares, frequently together with his brother Paco Cortés. The two of them have traversed all of Spain and they have completed numerous tours all over the world. In 1994 he won the first Premio del Certamen de Guitarra Paco de Lucia. Next, in 1995, he presented two concerts with his own company at Teatro Alhambra in Granada. In December of the same year he also collaborated on the recording of the “Omega” CD by and with Enrique Morente. Since then, he has often been invited for recordings, e.g. by Estrella Morente, El Polaco and Paco Cortés. Halfway 1998, he started recording his well-known solo-CD “Patriarca”, which confirmed his great musical gift as a guitar player and which also introduced his talent for composing. 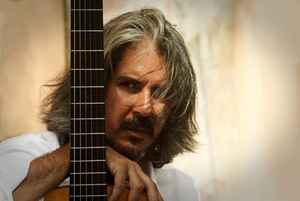 His work shows proof of an extraordinary refinement and sensitivity on the field of classical guitar play, but also combined with a meticulous search for new forms of music. In 2006 he completed his second solo CD: “Bordón de trapo”, produced by Gerardo Nuñez and with the collaboration of Carmen Linares, Arcángel y Esperanza Fernández. Although he has on many occasions proven to be an excellent solo guitar player, he still collected the majority of his fame in being one of the greatest contemporary guitar players for accompaniment of singers. The fact that he recently has been sharing the stage with the biggest stars from the Cante proves this fact. Artists such as Estrella Morente, Carmen Linares, Arcángel, Miguel Poveda, Esperanza Fernández have all been known to call on his exceptional talent.